Sometimes you wonder where they come from. Parish names, that is. Castle Le(a)vington is a township rather than a parish, actually, but a visitor may well wonder where the ‘castle’ is, or even was. You’d be unlikely to find it on the ground, though it is still marked as ‘Castle Hill’ on the OS map, tucked into a twist of the River Leven on the modern-day border of North Yorkshire. In case you still can’t find it, it’s about three miles SE of Yarm. 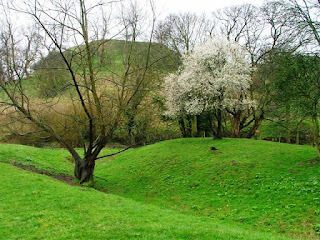 Here is a large steep hill, called the Castle-Hill, from which Castle Levington probably derives its name. It is situated on the banks of the Leven, is of a circular form, characteristic of a Danish fortification, but no vestiges of any building have ever been discovered. It’s not likely to be Danish, with the history books now attributing its founding to Robert de Brus in the early 12th century. Unlike many such earth and timber constructions, it was never ‘upgraded’ in stone, and faded away rather quickly in the ensuing centuries. It was dismantled in the second half of the 12th century, then the de Meynel’s maintained a timber hall on the spot from the late 13th to the late 14th centuries. And that seems to have been the end of human activity. Though only the protective earthworks remain today, it is clear that a considerable amount of effort went into the site during the ‘castle’s’ short lifetime. In the early 1980s, Nunthorpe, on the southern edge of the Middlesbrough conurbation, gave birth to and raised three of our most prominent sportsmen. Amazingly, in the space of six years, from 1980-85, three individuals were born there who were all to rise to international stardom in recent times. The eldest of these, Jonathan Woodgate, was born on 22nd January 1980. Appearing for club sides Leeds, Newcastle, Real Madrid, Middlesbrough, Spurs and (currently) Stoke, he rose to the very top of his profession when he appeared for England eight times during 1999-2008. An immensely talented centre-half, his career has been cruelly blighted by injury, misfortune and not a little controversy. Chris Tomlinson was born on 15th September 1981, and has been Britain’s premier long-jumper since he broke the long-standing national record in the discipline in 2002, and, though he missed out on the 2008 Olympic Final, he remains a high hope for London 2012. Liam Plunkett is the youngest of Nunthorpe’s sporting stars, entering this world on 6th April 1985. He has excelled for Durham County Cricket Club since making his debut for them in 2003, moving into the upper echelons of the cricketing world during 2005-07 with several appearances for England at both Test and One-Day International level. He enjoyed Championship success with Durham in 2008 and 2009, and remains on the fringe of the national team. I assume all three were born in the (now closed) Poole Hospital to the south of the modern-day Nunthorpe – though I stand to be corrected. For as long as anyone can remember, somewhat indistinct areas of what is now known as ‘Cleveland’ have been known by the ancient name of ‘Langbaurgh’. ‘Redcar and Cleveland’ – basically eastern Cleveland, from Redcar to Staithes – has been especially linked to the term. This odd-sounding, strangely-spelt placename is a funny old concoction, and I can’t be the only north-easterner who hadn’t a clue where it came from – until, that is, I made a concerted effort to find out. It transpires that the name comes from the ‘village’ of the same name a little to the north of Great Ayton – which, ironically, now lies a few yards over the border in North Yorkshire. I say ‘village’, but there’s not really very much there, and one wonders how the heck it ever came to lend its name to the huge tracts of land which lie to the north and east. The answer seems to lie in the geological feature which overlooks the village to the north, namely, Langbaurgh Ridge. It lies bang on the North Yorkshire border, and derives its name from the words ‘Lang’ (long) and ‘Beorge’ (hill). Turns out that this ‘long-hill’ has been an ancient meeting point since the Viking era – in other words, the administrative centre of the local ‘wapentake’. And this was one big wapentake, extending and including everything on the map from Middlesbrough down to Whitby. For centuries, the terms ‘Langbaurgh’ and ‘Cleveland’ (pre-1974 version) were pretty much interchangeable. In time, bits of it were hacked off and subdivided. But ‘Langbaurgh’ lived on long into the modern age as an administrative area, in the absence, even, of anything much so-named ‘on the ground’. It was even resurrected in 1974 as the name of a non-metropolitan district of the newly-created ‘County of Cleveland’. In 1996, the area in question was re-branded as ‘Redcar and Cleveland’. So will we now be able to finally shake off the curious old placename? When it comes to ranking the North-East’s many landmarks, Cleveland’s Roseberry Topping would surely make everybody’s Top Ten. Even before the dramatic geological slip of a century ago which gave it its lopsided look, the hill was a prominent and popular feature of the landscape. Forming an isolated limb of the area of the North York Moors known as the Cleveland Hills, Roseberry Topping has been admired – and sometimes revered – for centuries. Whilst a mere molehill alongside its Swiss look-alike, the Matterhorn, the pride of Cleveland looks a good deal loftier than its 1,049 feet (320m). It is not even the highest fell of the Moors, though it may as well be, such is its fame. Quite apart from its shape, its composition is not difficult to discern, at least for the trained eye. Formed from sandstone laid down in the Jurassic period (165-208 million years ago) it is actually one of the youngest hills of its kind in the country. Whilst all around has been ground down by the glacial flows of successive ice ages and blown away by the weather, the harder sandstone (gritstone) cap has held firm to leave us with the prominence we see today. Beneath the bare, graffiti-carved peak, there lie layers of alum rock (at its base), ironstone, then strata of fossil-ridden clays and shales before its hardy peak. Until a little before the outbreak of the First World War, though, the shape of the hill looked a good deal more formal. But a combination, probably, of the mining activity of man and a geological fault brought half the fellside tumbling down one noisy summer night. A decade later another mini-slide occurred, and the terrain is still thought to be a little ‘tender’ today. If, now, Roseberry Topping sticks out, quite literally, like a sore thumb, then its former, more conical form, drew at least as much attention from all who cast their eyes upon her previously. Most especially, perhaps, in ancient times. A Bronze Age hoard was found hidden on its slopes in the nineteenth century (now in Sheffield City Museum), and it was certainly occupied in the Iron Age – as is evidenced by the faint remains of huts and enclosures from the period, dated, via pottery shards and pollen, to around 110BC. The name itself has a complex derivation. It comes at least partly from the Viking period, whose people seem to have taken a particular liking to the fell. To find the very root of ‘Roseberry’ we have to begin with the Old Norse Óðin’s boerg (Odin’s rock or crag – Odin being the chief god of Norse paganism). The name then passed through a myriad of corruptions before finally settling for some time on ‘Ouseberry’. The initial ‘R’ was picked up, it is said, from the ‘r’ of the word ‘under’ in the old village name of Newton-under-Ouseberry’ (now Newton-under-Roseberry). Even the word ‘Topping’ comes from the Old Norse word toppen, meaning ‘hill’. It was common for the Vikings to make offerings to the greatest of their gods at prominent high hills, which thereafter often picked up the godly moniker. Other theories regarding the name exist, one suggesting that it may in part derive from the ancient word ross (meaning heath or common), combined with bury (or burh, meaning a fortified place) – but these arguments are rather thin. Let Cleveland then beware of a clap! Among the many hundreds of thousands – perhaps millions – of folk who have traversed its slopes and conquered its modest summit, the most renowned must surely be the explorer Captain James Cook. Born a few miles to the north in a cottage at Marton (now a suburb of Middlesbrough) in 1728, he moved to a farm near Great Ayton in 1736. Aireyholme Farm, in the shadow of Roseberry Topping, remained his home for nine years, where he attended the village school at Ayton before moving on to help his father run the farm from 1741. He would spend his spare time wandering the fells around his home, with the summit of Roseberry Topping itself little more than half an hour’s brisk scramble. It is generally believed that it was these rambles which engendered in the young lad the spirit of adventure which would one day take him to the other side of the world. When he was 16 he moved to Staithes on the Yorkshire coast, and thereafter onto Whitby, where his great career of exploration would begin to flourish. In the late Victorian era the Roseberry Ironstone Company opened mines on the southern side of the hill and worked the seams there for a few short years. The Tees Furnace Company revisited the site a little later, whose activity was superseded by that of Burton & Sons during 1906-1926 – employing around 200 men at one point. For many years, too, the hill formed part of a private gaming estate – the fine old shooting box / shelter can still be visited on its south-western approaches. Now, however, Roseberry Topping forms part of the North York Moors National Park, is looked after by the National Trust and is visited daily in sizeable numbers by the general public. Additionally, a spur of the popular long-distance walk, the Cleveland Way, runs to the summit. To add to its list of ‘titles’ the hill has also been designated a Site of Special Scientific Interest and is listed as being of national importance in the Geological Conservation Review. Of major interest in this regard are the aforementioned fossils, and lots of them – over seventy species in all (both plant and animal), suggesting a saltmarsh-like habitat during the Jurassic period. With the passage of time several of the hill’s features have disappeared. A hermitage was once to be found near the summit, and what was described as a “small smith’s forge” hewn out of the rock seems no longer to be evident. St.Winifred’s (or Wilfred’s) Needle, a small cleft in the rocks – again near the summit – has also disappeared amidst the mining activity of the recent past. Springs and wells have featured prominently in the myths and legends surrounding Roseberry Topping. 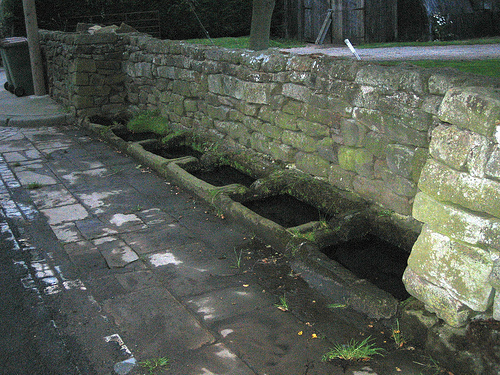 The ‘Cold Well’ marked on the present-day OS map a few hundred metres to the south of the summit is probably the very same watery feature once known as St.Oswald’s Well, whose waters were once thought to be able to predict the fate of a seriously sick person by the casting in of an article of their clothing. If it sank they were doomed, if it floated they would live. In earlier accounts of the well it was thought to have curative effects on diseases of the eye. William Camden, in his celebrated Britannia, however, places this magical damp spot near the summit itself, where a spring once flowed from a huge rock – and there is a myth to go with this, spring, too, it being the spot where a former prince of Northumbria was supposed to have drowned. The hill can be approached from several directions by foot, the most common trails being from Newton-under-Roseberry to the west-by-north-west, the car park beyond Gribdale Terrace to the south-east, or Great Ayton to the south-west. All walks are admirable at all times of the year and relatively straightforward. The 360° views are excellent reward for minimum effort, and there are plenty of diversions to be enjoyed – the most notable of all, perhaps, being Captain Cook’s Monument on Easby Moor to the south-by-south-east. There is, too, a great diversity of countryside and townscapes all about. Great Ayton, Guisborough and the great sprawl of industrial Teesside dominate to the north and west (with a hint of North Sea, too), whilst miles of unbroken moorland lie to the south and east. Woods and plantations dot the landscape, and quarry and mine workings – for ironstone, whinstone, alum and jet – have left their not too intrusive marks on the lower flanks of the fell. The multitude of smaller diversions all help to add to the area’s undoubted charm. The moorland all about provide much of interest to the budding naturalist, and whilst strolling Great Ayton Moor to the east one may be tempted to take in those ancient enclosures, cairns and field systems shown on the large scale OS map. And the memory of Captain Cook, of course, casts a large shadow over the vicinity of Roseberry Topping. Aireyholme Farm nestles snugly to the south of the summit, his monument sits across the gentle folds a little further in the distance, and the pretty village of Great Ayton thrives on its connections with the man’s childhood. Here the visitor will find the ‘Captain Cook Schoolroom Museum’, a statue of a young James Cook, a memorial built on the site of Cook’s father’s house, and All Saints Parish Church where many of the Cook family are buried. For a bit of everything at such close proximity to civilisation, Roseberry Topping is truly one of the region’s finest tourist attractions. The item of Roman cavalry headgear known as The Guisborough Helmet was found at Barnaby Grange Farm, a little to the west of the town after which it was named in August 1864. Like the recently discovered Crosby Garrett Helmet, it was found buried in a flattened state in total isolation from other Roman remains, which has led experts to suggest it was interred as a votive offering by an ex-soldier. When it was originally found – during excavations for a road underpass beneath a railway line – it could be neither identified for what it was, nor an accurate estimation given as to its age. The copper-alloy piece was at first thought to be a breastplate, and that it was perhaps Celtic or Anglo-Saxon. It was not properly identified as a third century Roman helmet until as late as 1878 after its donation to the British Museum by the landowner Frederick Greenwood. It was then restored, and now sits on display in the museum itself. 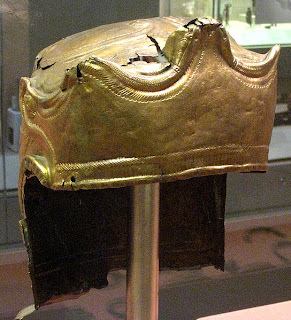 No one seems to know whether the head-piece was purely ceremonial, or if it was also used in battle – but it is undoubtedly one of the region’s greatest archaeological treasures. © Copyright MichaelGraham and licensed for reuse under this Creative CommonsLicence. Highcliffe Nab is a rocky outcrop of the Cleveland Hills, a spot which offers spectacular views in all directions – with its bare northern face staring down directly into the town of Guisborough a mile or so distant (as illustrated above). It rises to an impressive 310m above sea level – or 1,017 ft in old money – and is currently a highlight of the Cleveland Way long-distance footpath. It is now known as the site where the very earliest traces of human activity have been uncovered across the whole of Teesside. And all as a result of the efforts of a couple of amateur archaeologists who, in the 1990s, uncovered more than 2,000 worked flints from the Nab dating from 6,000 to 3,200 years BC (Mesolithic). Norman and Patricia Harbord had the distinction of pushing the area’s traceable history back into the era of the hunter gatherer, when our ancestors required a lofty perch from which to observe the migration of herds of wild animals. Subsequent poking about around the site has produced hundreds more similar finds, as well as the remains of fires – indicating that meat processing and temporary camps were to be found thereabouts; though no evidence has been found of permanent settlement. The Nab may also have been used as a beacon point. As a further point of interest, the image above shows a rust-coloured seam of ironstone running vertically through the cliff. 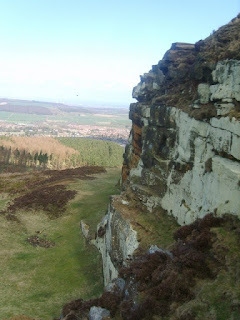 It is the proliferation of outcrops like Highcliffe Nab in this part of the world, of course, that gives the area – Cleveland, or ‘Cliff-land’ – its name. One of Canada’s greatest railway pioneers, Joseph Whitehead was born in Guisborough in 1814. He began his engineering career very young, reportedly serving as a fireman on Stephenson’s famous Locomotion in the 1820s, before progressing to railway construction – most notably having a hand in the Caledonian Railway in Scotland. He made the bold move to Canada in the late 1840s, dragging his young family with him, where he helped build sections of the Great Western and Grand Trunk Railways and many more besides. 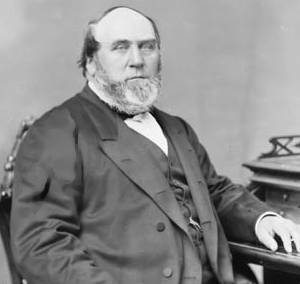 Whitehead also dabbled in politics, becoming mayor for Clinton, Ontario, and serving as a Liberal MP in the 1st Canadian Parliament during 1867-72. He was an entrepreneur, too, building a sawmill, among other things. Sensationally, in 1877, he brought the very first steam locomotive to the Canadian prairie provinces when he bought the Countess of Dufferin and transported it to its new home by boat up the Red River to Winnipeg. The train is today a museum piece in the city. Whitehead eventually retired to Clinton, Ontario, and died there in 1894 – aged 80 and a very long way from his native parish. His daughter, Charlotte, became a pioneer female doctor; and his gt-gt-granddaughter, Val Meredith, served as a Canadian MP as recently as 1993-2004. 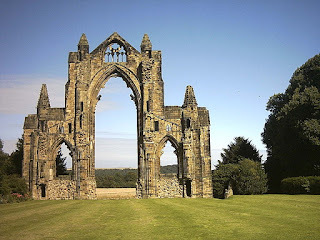 After Henry VIII had finished with his Dissolution of the Monasteries in the 1530s, there was a fair bit of unclaimed worked masonry lying around the countryside. Though not all of the nation’s monastic concerns were demolished and recycled, over time a fair few were. 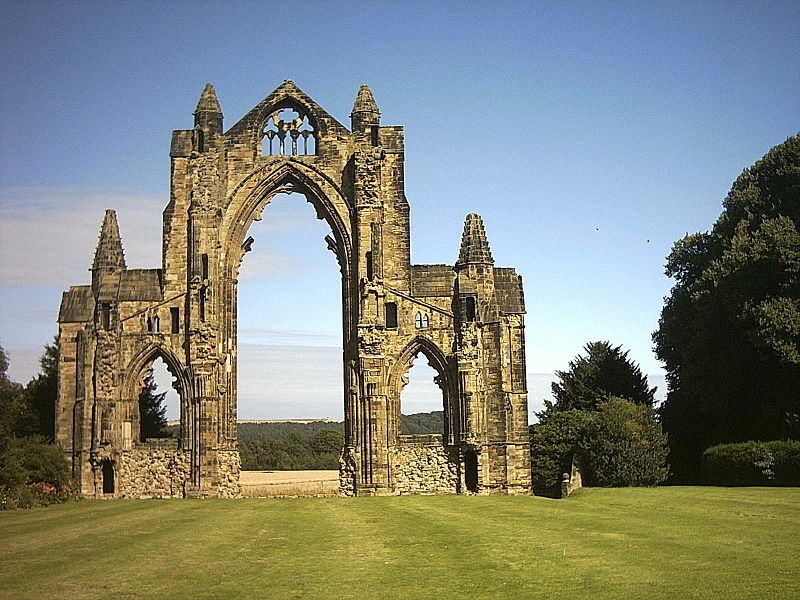 Gisborough Priory is fairly typical in this respect. Formally ‘dissolved’ in April 1540, it was not properly surrendered to the king’s men until December of that year, making it one of the last institutions of its kind to be handed over. There was a plan of sorts to convert the old place into a secular college, but it never came to fruition – and the buildings were almost completely flattened soon afterwards. A certain Thomas Legh was given permission to do so and the pieces “carried away”. The Chaloners eventually bought the site, moving into what was left of the complex before relocating to their new mansion, Old Gisborough Hall, in the late 17th century. The site underwent further clearance work at this time, and the grounds redeveloped as formal gardens for the Chaloners’ new home. I have seen with my own eyes broken pillars and pedestals of this august pile desecrated to the vile uses of gateposts, stands for rainwater casks, and stepping-stones over a common sewer. A richly ornamented doorway of the venerable priory forms the entrance to a privy. I have beheld with sorrow, shame, and indignation, the richly ornamented columns and carved architraves of God's temple supporting the thatch of a pig-house. Well, not so much ‘mysteries’, more ‘oddities’, really. Take, for example, the fact that the village’s most famous historical relic is its set of watery features known as the ‘Moorsholm Docks’ – despite the sleepy settlement’s decidedly landlocked situate. OK, then, so they’re not real ‘docks’, but more accurately a set of half a dozen sunken water troughs which lie against a boundary wall at the northern end of the village. A curious sight in themselves, regardless of their ambitious name. One can only assume that some joker first coined the phrase many years ago and it stuck. Picture a dozen or so cows or horses nestling up against the man-made waterway and you can just about see how the analogy was made. Then there are the strange-sounding pubs that exist, or have existed, in the village. What was formally The Plough is now the Toad Hall Arms – and no one seems to be able to explain the odd new title. Then there’s the (fairly) nearby Jolly Sailor … in the middle of the moors? And, furthermore, there used to be another pub called The Station hereabouts – despite the planned railway line never actually being built! And, yes, that planned and abandoned railway link still, sort of, survives. The remains (for what they are) usually being referred to as ‘Paddy Waddell’s Railway’, after the guy behind the failed plan. As if that isn’t enough, the nearby Freebrough Hill is the burial place of King Arthur, don’t you know?